Are you ready for your dream vacation? Located in the heart of East Beach our “Deluxe” villa affords a scenic view, screened in porch and a back deck steps away from the soccer field at Night Heron Park! Our guests enjoy full access to KIAWAH ISLAND GOLF RESORT AMENITIES, including enjoyment of Resort swimming pools and discounts of up to 25% on golf, preferred tennis times, concierge service and recreational programs. The Kiawah Island Golf Resort’s complimentary on-island shuttle transportation is available from 7am – 11pm to take you to golf courses, restaurants, The Sanctuary Hotel, or wherever you wish to go on Kiawah Island. If you are looking to be close to the beach it is only a 5-minute walk away. This villas décor is casual and sure to make you feel as if you have located your ideal dream bungalow. Enjoy this spacious one story, first floor, 3 bedroom, 3 bathroom villa with gracious living space. All 3 bathrooms renovated 2016. 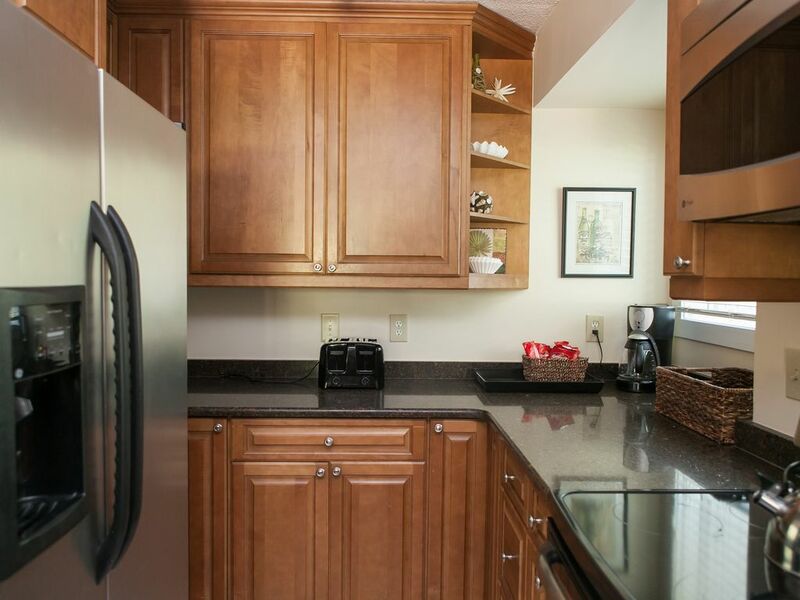 The newly renovated kitchen is fully equipped and affords beautiful granite countertops, updated cabinets and stainless steel appliances. All of the furnishings are sure to please everyone from a golfer to the children. You will also enjoy the full size washer/dryer and high speed Internet in the villa. This villa is a NON SMOKING property. This unit will accept pets with a $25/night pet fee. The full payment is due at the time of booking, and all deposits are non-refundable. The unit was very clean and spacious with ever amenity needed. Wish we could have stayed longer! A nice family vacation spot! This was a great 3 bedroom, 3 bathroom villa with all we needed for our week at Kiawah! Check in and check out were a breeze. Having access to all the resort benefits was terrific. Pros: location, ease of walk to beach and central amenities, villa layout, full kitchen, laundry facilities, parking, pet friendly, screened in dining area. Cons (only a few small ones): DVD player didn't work (management offered to address but it was close to our departure time); beds / bedding were OK but could use an upgrade; some construction next door but they were considerate. Overall I highly recommend! Great 3 br condo. Welcomed having a private bath for each br. Beds were very comfortable. Condo and furnishings were very family friendly. Condo location was ideal: centally located to family friendly food, nature center, and ocean, all within a very short walk. Bike rentals are handy, and the bike riding on the beach and paths is an absolute joy. Would highly recommend this condo to anyone. Great, great, great!!!! Beautiful comfortable family friendly condo. Wonderful location - close to Night Heron Park and nature center.Easy to bicycle to trails and short stroll to beach. Condo is well equipped for cooking and eating in - East Beach Deli is convenient. Overall March is perfect time to visit Kiawah - weather wonderful and not too many people. Great condo with super location! Furnishings are attractive and comfortable. Night Heron park is a few steps from the back door with features such as a fitness trail, pool, soccer fields, nature center with bike rentals, and bike and walking trails. A quick walk takes you to the East Beach conference center and deli. Follow a walking path and cross an awesome wooden bridge to get to the beach. We enjoyed ourselves immensely and hope to return soon! Kid's camp, nature tours, soccer, sand volleyball, archery and more! Seven night, Saturday-to-Saturday stay required during Easter, Summer and July 4th seasons. Pets are allowed with a $25/night pet fee.